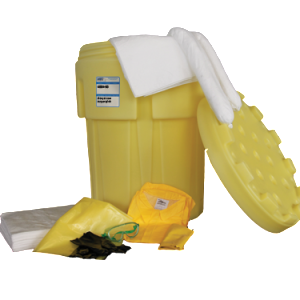 MBT spill kits are an essential part of any effective spill control plan. Bagged spill kits are perfect for fast response to small spills, while container spill kits provide quick response to medium sized chemical spills. Our MBT overpack spill kits provide all the spill absorbents you need to tackle large spills. Our mobile spill cart kit allows for a quick response to large spills. Contains necessary absorbents for quick and efficient spill responses to general purpose, oil and aggressive chemical spills. MBT’s bagged spill kits contain all the necessary absorbents for efficient spill response and spill containment. These lightweight spill kits come in different sizes and in different bags, which include our truck spill kit, economy bag kit, and our emergency spill response bag kit. 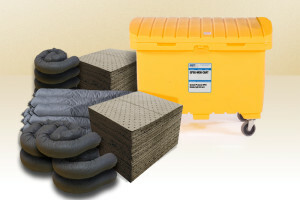 MBT’s container spill kits are all you need for any medium sized spill. Our container kits are designed to keep you ready for quick response. Choose from our various spill cleanup products like our bucket kit, container spill kits, or our 30 gallon overpack spill kits that come packed with quality MBT absorbents. These absorbents allow you to deal with spills ranging from 10 to 30 gallons. 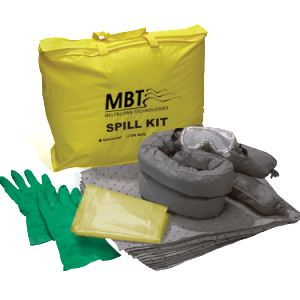 Effectively deal with a wide range of spills with MBT’s overpack spill kits. Each 50, 65 and 95 gallon overpack container is packed full of industrial absorbents for fast response to all types of spills. 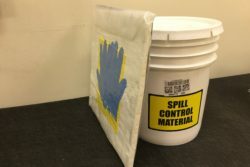 These spill cleanup kits are best for use with medium to large spills. 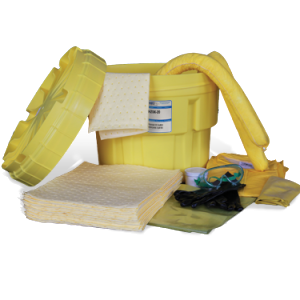 MBT overpack spill kits are great for your commercial and industrial spill cleanup needs. When a spill occurs, time is of the essence to ensure a quick response and safe cleanup. Here are some helpful hints to make sure you, your employees, and the environment are protected. Evaluate the type of material spilled and identify the source. If you are NOT familiar with the liquid and its chemical properties, vacate the area and contact proper authorities. Wear the appropriate protective gear for the situation. If the source or the material is not identifiable, assume the worst. Contain the liquid and seal drains. Close valves, rotate punctured drums and plug leaks where it is possible and safe to do so. Use MBT absorbents to absorb spilled liquids. Report the spill to proper legal authorities in your community. Be sure to fill out all necessary reports in accordance with local laws. Absorbent materials take on the characteristics of whatever they absorb. Be sure to dispose of used absorbents and spilled liquids in accordance with local laws. Clean all tools and reusable materials properly before reuse. Replace absorbent materials and safety equipment used in any cleanup operation. 10. Review Contingency Plans and Procedures!